During ovulation, it has been shown that LH stimulus induces the expression of numerous genes via PKA, p38 MAPK, PI3K and ERK1/2 in cumulus cells and granulosa cells. Our recent study showed that EGF-like factor and its protease (TACE/ADAM17) are required for the activation of EGF receptor (EGFR), cumulus expansion and oocyte maturation of porcine cumulus-oocyte complexes (COCs). In the present study, we investigated which signaling pathways are involved in the gene expression of EGF-like factor and in Tace/Adam17 expression in cumulus cells of porcine COC during in vitro maturation. Areg, Ereg, Tace/Adam17, Has2, Tnfaip6 and Ptgs2 mRNA expressions were detected in cumulus cells of porcine COCs by RT-PCR. Protein level of ERK1/2 phosphorylation in cultured cumulus cells was analyzed by westernblotting. COCs were visualized using a phase-contrast microscope. When COCs were cultured with FSH and LH up to 2.5 h, Areg, Ereg and Tace/Adam17 mRNA were expressed in cumulus cells of COCs. Areg, Ereg and Tace/Adam17 gene expressions were not suppressed by PI3K inhibitor (LY294002), whereas PKA inhibitor (H89), p38 MAPK inhibitor (SB203580) and MEK inhibitor (U0126) significantly suppressed these gene expressions. Phosphorylation of ERK1/2, and the gene expression of Has2, Tnfaip6 and Ptgs2 were also suppressed by H89, SB203580 and U0126, however, these negative effects were overcome by the addition of EGF to the medium, but not in the U0126 treatment group. The results showed that PKA, p38 MAPK and ERK1/2 positively controlled the expression of EGF-like factor and TACE/ADMA17, the latter of which impacts the cumulus expansion and oocyte maturation of porcine COCs via the EGFR-ERK1/2 pathway in cumulus cells. In mammals, luteinizing hormone (LH) stimulation induces morphological and physiological changes in granulosa cells and cumulus cells, causing them to progress to the ovulation process . During this period, cumulus cells expressed cumulus expansion-related genes, Hyaluronan synthase 2 (Has2) [2, 3], Tumor necrosis factor α-induced protein 6 (Tnfaip6) [4, 5], and Pentraxin 3 (Ptx3) [6, 7], which is necessary for the synthesis and stability of hyaluronan-rich extracellular matrix. In Tnfaip6 null mice  or Ptx3 null mice , number of ovulated oocytes decreased and in vivo fertilization was completely interrupted, suggesting that cumulus expansion was essential for both ovulation and fertilization processes. It is known that since LH receptor (Lhcgr) is mainly expressed in granulosa cells, the EGF-like factor produced in granulosa cells by LH surge acts on cumulus cells to induce cumulus expansion. Some factors were introduced to transmit the LH signal from granulosa cells to cumulus cells. For example, prostagrandin E2 (PGE2) that produced from granulosa cells and cumulus cells by prostagradin synthase 2 (PTGS2) was required for induction of Has2 and Tnfaip6 gene, cumulus expansion and oocyte meiotic resumption . The EGF-like factors, Amphiregulin (AREG), Epiregulin (EREG) and β-cellulin (BTC) were also recently reported as potent factor. The EGF-like factor was induced by LH stimuli in granulusa cells, and EGF receptor (EGFR) was localized on cumulus cells [9–11]. 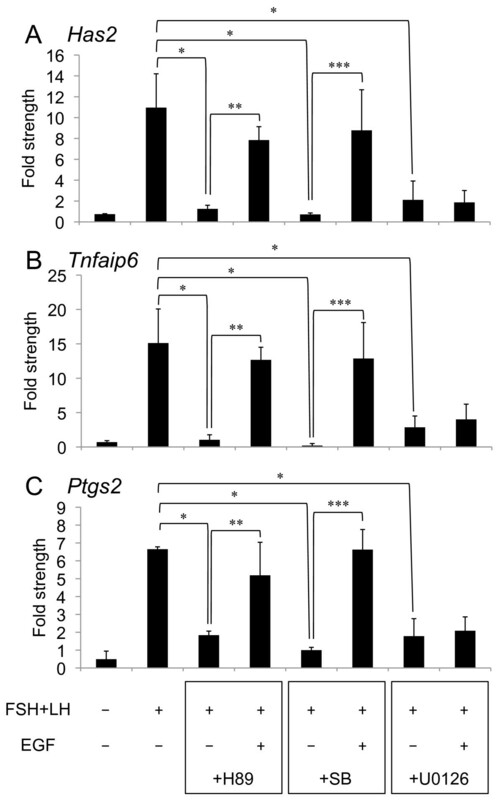 When mouse COCs were cultured with AREG, Has2, Tnfaip6 and Ptgs2 were expressed in cumulus cells. TACE/ADAM17, the cleavage enzyme of EGF-like factor to soluble forms, was also expressed in porcine granulosa cells in vivo in response to hCG administration . Thus, in vivo during the ovulation process, LH induces EGF-like factor expression in granulosa cells and the release of the EGF domain by TACE/ADAM17 acts on cumulus cells, which induce cumulus expansion. In in vitro maturation of oocytes, COCs were recovered from antral follicles and cultured with FSH and/or LH. We previously showed that FSH and LH up-regulate EGF-like factor and Tace/Adam17 mRNA expression, and gonadotropins-induced cumulus expansion and oocyte maturation of porcine COCs were suppressed by EGF receptor tyrosine kinase inhibitor or TACE/ADAM17 inhibitor . The results suggested that FSH- and LH-induced cumulus expansion was dependent on the expression and functions of EGF-like factors. Although the regulation of EGF-like factor expression in cancer cell lines has been reported [14, 15], the mechanisms of EGF-like factor and TACE/ADAM17 expression in cumulus cells cultured with FSH and/or LH have remained unclear during in vitro maturation of porcine COCs. The binding of FSH and/or LH in granulosa cells to its own receptors led to rapidly and nongenomic activation of PKA, p38 MAPK, and PI3K in a cAMP-dependent manner  and of ERK1/2 via the SRC/RAS-dependent pathway . In mice, since each inhibitor of PKA, p38 MAPK, PI3K or ERK1/2 suppressed the expression of cumulus expansion-related gene [10, 18, 19], cumulus expansion [18, 19] or meiotic maturation of oocyte , we estimated that these signaling pathways induced by gonadotropin overlap the EGF-like factor-EGFR pathway, which induces full cumulus expansion and oocyte maturation. In this study, to clarify the intracellular pathway involved in EGF-like factor and Tace/Adam17 expression in cumulus cells, we examined the effect of PKA inhibitor (H89), p38 MAPK inhibitor (SB203580), PI3K inhibitor (LY294002) and MEK inhibitor (U0126) on Areg, Ereg and Tace/Adam17 expression in cumulus cells during in vitro maturation of porcine COCs. Additionally, we investigated the effect of these drugs on ERK1/2 phosphorylation, cumulus expansion and oocyte meiotic resumption in pig. High purified porcine FSH and porcine LH were gifts from the National Hormone and Pituitary Program (Rockville, MD, USA). Fetal calf serum (FCS) was obtained from Invitrogen (Carlsbad, CA, USA). Oligonucleotide poly- (dT) was purchased from Amersham Pharmacia Biotech (Newark, NJ, USA). Avian myeloblastosis virus reverse transcriptase and Taq DNA Polymerase were from Promega (Madison, WI). Routine chemicals and reagents were obtained from Nakarai Chemical Co. (Osaka, Japan) or Sigma (Sigma Chemical Co., St. Louis, MO, USA). Isolation of porcine COCs was described previously . Briefly, porcine ovaries were recovered from 5- to 7-month-old prepubertal gilts at a local slaughterhouse. COCs were collected from the surfaces of intact healthy antral follicles measuring from 3 to 5 mm in diameter. The 20 COCs were cultured up to 40 h with both 20 ng/ml highly purified porcine FSH (NIDDK, Torrance, CA) and 500 ng/ml porcine LH (NIDDK). The maturation medium was modified NCSU37  supplemented with 10% (v/v) FCS (Gibco BRL, Grand Island, NY) and 7 mM Taurine (Sigma St Louis, MO). At selected time intervals, COCs were collected for RNA and protein isolation. The assessment of cumulus expansion was observed using phase-contrast microscopy (Olympus IMT2, Olympus, Tokyo Japan) and a 10× objective. In the case of treatment with each specific inhibitor, namely PKA, H89 (10 uM) (Sigma), p38 MAPK, SB203580 (20 uM) (Sigma), PI3K, LY294002 (20 uM) (Sigma) or MEK, U0126 10 uM (Sigma), COCs were cultured for 0, 2.5, 5, 10, 20 or 40 h with each of these inhibitors. H89 was dissolved in maturation medium at 10 mM and stored at -20°C. SB203580, LY294002 and U0126 were dissolved in dimethylsulfoxide (DMSO) at 20 mM and 10 mM, respectively, and stored at -20°C. The final concentration of each compound (as described above) was obtained by dilution (1:1000) with the maturation medium. The final concentration of vehicles (DMSO) was 0.1% (vol/vol), which did not affect the function of cumulus cells during meiotic resumption of porcine oocytes . After cumulus cells were cultured, they were washed three times in PBS. Total RNA was extracted from cumulus cells using the SV Total RNA Isolation System (Promega) according to the instruction manual, and dissolved in nuclease-free water. The final RNA concentrations were determined by absorbance using a spectrophotometer. RT-PCR analyses were performed as previously described . Briefly, total RNA was reverse-transcribed using 500 ng poly-dT and 0.25 U of avian myeloblastosis virus-reverse transcriptase at 42°C for 75 min and 95°C for 5 min. PCR conditions were set as follows: cDNA was amplified for X cycles (Table 1) of denaturation at 94°C for 30 sec, primer annealing at Y°C (Table 1) for 1 min, and extension at 68°C for 1 min, with a final extension step of 7 min at 68°C. 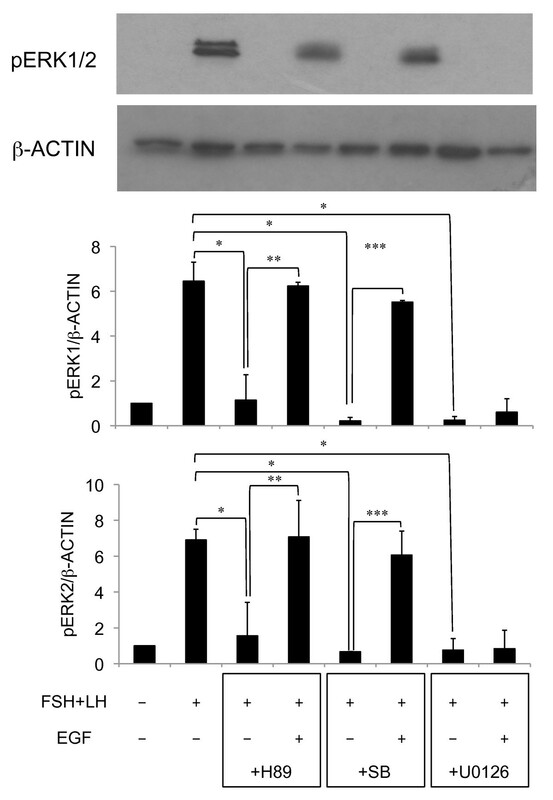 β-actin was used as a control for reaction efficiency and variations in concentration of mRNA in the original RT reaction. The amplified products were analyzed by electrophoresis on 2% agarose gels. The intensity of the objective bands was quantified by densitometric scanning using a Gel-Pro Analyzer. Specific primer pairs were selected and analyzed as indicated in Table 1. Cumulus cells were lysed in Laemmli sample buffer and protein extracts were stored at -80°C until use. After denaturing by boiling for 5 min, 10 ul of each samples containing equal amounts of protein (10 ug) was separated by SDS-PAGE on 10% polyacrylamide gel, then transferred onto PVDF membrane (GE Healthcare). The membrane was blocked with 5% (w/v) nonfat dry milk (GE Healthcare) in PBS. Primary antibodies were added in 2.5% (w/v) nonfat dry milk in 0.1% (v/v) Tween 20 (Sigma)/PBS (PBS-T), and incubated overnight at 4°C. Anti-phospho-ERK1/2 and β-ACTIN were purchased from Cell Signaling Technology, Inc (Beverly, MA) and diluted at 1:2,000 or 1:10,000, respectively. After four washes in PBS-T, the membranes were incubated for 1 h with a 1:2,000 dilution of goat anti-rabbit IgG HRP-linked antibody (Cell Signaling Technology, Inc) in 2.5% (w/v) nonfat dry milk in PBS-T at room temperature. After five washes of 10 min each with PBS-T, peroxidase activity was visualized using the ECL Western blotting detection system (GE Healthcare) according to the manufacturer's instructions. Statistical analyses of all data from three or four replicates for comparison were carried out by one-way ANOVA followed by Duncan's multiple-range test (Statview; Abacus Concepts, Inc., Berkeley, CA). All percentage data were subjected to arcsine transformation before analysis. COCs were cultured with FSH, LH and/or PKA inhibitor (H89), p38 MAPK inhibitor (SB203580), MEK inhibitor (U0126) or PI3K inhibitor (LY294002) for 2.5 h. The results showed that high levels of Areg, Ereg and Tace/Adam17 mRNA were observed when COCs were cultured with FSH and LH, and that the levels were not affected by LY294002 (Figure 1A, B, C). However, treatment with H89, SB203580 or U0126 significantly decreased these mRNA expression levels in cumulus cells (Figure 1A, B, C). When COCs were cultured with FSH and LH for 5 h, the phosphorylation status of ERK1/2 was detected. 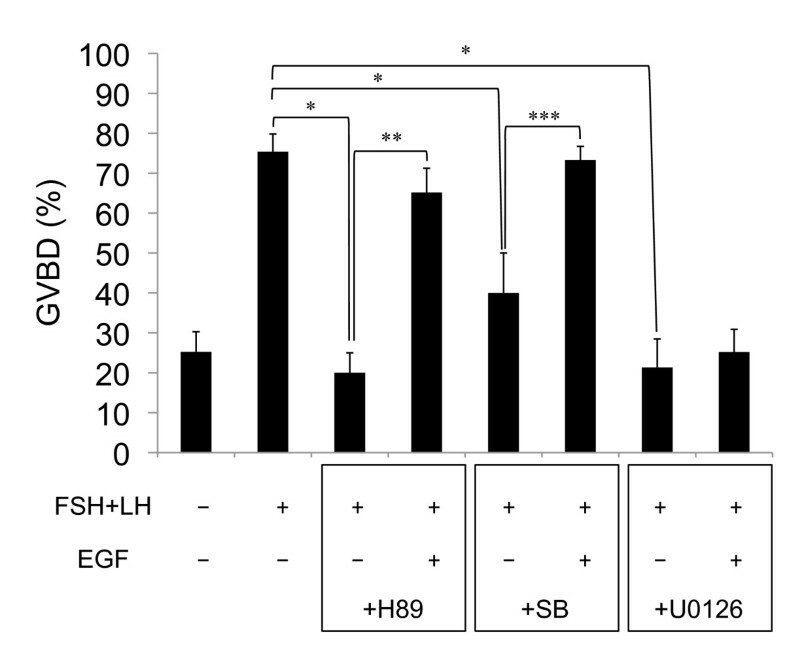 The addition of H89 or SB20580 to the medium significantly decreased the intensity of bands as compared with those in cumulus cells of COCs cultured without any inhibitor, and these inhibitory effects were overcome by addition of EGF (Figure 2). Treatment with U0126 also significantly suppressed ERK1/2 phophorylation in cumulus cells as compared with those in cumulus cells of COCs cultured without U0126; however, the addition of EGF to U0126-contained medium did not affect the phosphorylation. High levels of Has2, Tnfaip6 and Ptgs2 expression were observed in cumulus cells of COCs cultured for 10 h with FSH and LH as compared with those cultured without FSH and LH. The addition of H89, SB20580 or U0126 significantly suppressed FSH- and LH-induced Has2, Tnfaip6 and Ptgs2 expressions (Figure. 3A, B, C). Although the lower level of these gene expressions resulting from the addition of U0126 was not overcome by the addition of EGF, the addition of EGF to H89- or SB203580-containning medium overcame the negative effect of each inhibitor on these gene expressions (Figure. 3A, B, C). When COCs were cultured without FSH and LH for 20 h, the proportion of oocytes exhibiting GVBD was less than 25%. FSH and LH significantly increased the proportion of oocytes exhibiting GVBD. This higher rate was significantly decreased by H89 or SB20580, and the suppression was counteracted by the addition of EGF (Figure 4). Treatment with U0126 also significantly suppressed the GVBD rate, whereas the addition of EGF did not overcome the negative effects. The culture of COCs with FSH and LH for 40 h induced the full expansion of COCs (Figure. 5). The expansion was completely suppressed by treatment with H89, SB20580 or U0126 for 40 h. Although the negative effects of H89 and SB20580 were overcome by the addition of EGF, the treatment with EGF did not overcome the negative effects of U0126. Effect H89, SB203580 or U0126 on cumulus expansion of cultured COCs. Without FSH and LH: COCs were cultured without FSH and LH for 40 h; With FSH and LH: COCs were cultured with FSH and LH for 40 h; +H89: COCs were cultured with FSH, LH and H89 for 40 h; +H89+EGF: COCs were cultured with FSH, LH, H89 and EGF for 40 h; +SB: COCs were cultured with FSH, LH and SB203580 for 40 h; +SB+EGF: COCs were cultured with FSH, LH, SB and EGF for 40 h; +U0126: COCs were cultured with FSH, LH and U0126 for 40 h; +U0126+EGF: COCs were cultured with FSH, LH, U0126 and EGF for 40 h.
Recently, it has been showed that the novel paracrine/autocrine factors expressed in granulosa cells and cumulus cells by LH stimuli acted on cumulus cells to induce cumulus expansion, meiotic maturation of oocytes and ovulation in mouse [9–11]. Since the suppression of the EGF receptor tyrosine kinase activity by specific inhibitor completely suppressed cumulus expansion and meiotic maturation of oocytes during in vitro maturation of mouse COCs , the EGF-like factor was quite important for ovulatory process. During in vitro maturation of porcine COCs, the addition of EGF to maturation medium significantly elevated developmental competence of oocytes to blastocyst stage , indicating that investigation of the transcriptional mechanism of the EGF-like factor and TACE/ADAM17 was essential for not only ovulatory process, but also cytoplasamic maturation of oocyte. It has been reported that during the ovulation process the PKA-dependent pathway involving the ligand activation of G protein-coupled receptors by their ligands in cumulus and/or granulosa cells induced the expression of ovulation-related genes, including Cyp11a1 , Star  and Ptgs2 . Other reports documented that, in rat granulosa cells, FSH and LH up-regulated the phosphorylation of p38 MAPK by a PKA-independent mechanism that might be involved in Epac . Furthermore, a recent report showed that FSH nongenomically activates ERK1/2 via SRC/RAS dependent pathway in rat granulosa cells , indicating that the activation of ERK1/2 was not directly activated by cAMP-activated PKA or p38 MAPK pathway. In this study, when porcine COCs were cultured for 2.5 h with PKA inhibitor, p38 MAPK inhibitor or MEK inhibitor, FSH- and LH-induced Areg, Ereg, and Tace/Adam17 mRNA expressions were significantly suppressed. In osteoblastic cells, the promoter region of the Areg gene had a putative CRE site, and the region was quite important for parathyroid hormone-induced Areg gene induction via CREB phosphorylation . In rat granulosa cells, it has been reported that the phosphorylation of CREB was induced by FSH within 1.5 h . Our recent study showed in rat granulosa cells that phosphorylation of CREB was induced by FSH dependent manner and the phosphorylation of CREB was essential for transcription of Areg mRNA via its promoter region of CRE site (Shitanaka et al., unpublished data). We also showed in granulose-specific Erk1/2 knockout mice that Areg expression level was significantly lower than that in wild-type mice . It is known that CREB has the sites phosphorylated by ERK1/2 and p38 MAPK [31, 32]. Thus, at early in the process, p38 MAPK and ERK1/2 might be involved in the phosphorylation of CREB, which would induce Areg gene expression in cumulus cells of porcine COCs. Our previous study showed that EGFR tyrosine kinase inhibitor or TACE/ADAM17 inhibitor suppressed the phosphorylation of ERK1/2 and the meiotic resumption of oocytes . 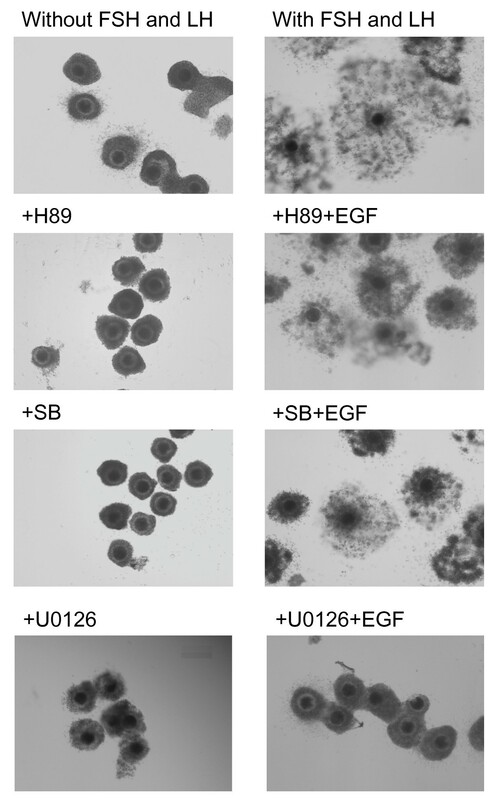 In this study, the addition of EGF to PKA or p38 MAPK inhibitor-containing medium overcame the negative effects or cumulus expansion and oocyte meiotic resumption. However, when COCs were cultured with U0126, the treatment with EGF did not overcome the U0126 effects. Thus, the MEK-ERK1/2 pathway played dual roles in cumulus cells. One role is the induction of EGF-like factor and TACE/ADAM17 expression. The other is direct induction of cumulus expansion of porcine COCs. In granulosa cell specific Erk1/2 knockout mice, the cumulus expansion was completely suppressed via the low induction of Ptgs2 expression. In this study, the Ptgs2 expression level was suppressed by U0126, suggesting that EGF-like factor was required for the induction of cumulus expansion and oocyte meiotic resumption in porcine COCs as well as in mice. Herein, we showed that the expression of EGF-like factor and TACE/ADAM17 in cumulus cells was induced by a PKA-, p38 MAPK- and ERK1/2-dependent mechanism during in vitro maturation of porcine COCs. The intracellular mechanism of induction of the expression of EGF-like factor and TACE/ADAM17 further induce EGF-like factor and Tace/Adam17 mRNA expressions in cumulus cells via ERK1/2 activation. Thereby, the ERK1/2 maintained its activity via the EGF domain-EGFR-ERK1/2 pathway, which resulted in full cumulus expansion, and oocyte maturation during in vitro maturation of porcine COCs. Supported, in part, by grant-in-Aid for Scientific Research (Y.Y., No. 19880020) and (M.S., No. 18688016) from the Japan Society for the Promotion of Science (JSPS). Porcine FSH and LH were kindly provided by Dr. A.F. Parlow, the National Hormone and Pituitary Program, the National Institute of Diabetes and Digestive and Kidney Disease, USA. We thank Mr. I Kawashima, Mr. T. Mizukami, Mr. T. Koike, and Ms. M. Okamoto for technical assistance. We also thank the staff of the Meat Inspection Office in Hiroshima City and Tottori prefecture for supplying the porcine ovaries. YY and MS conceived of the study, participated in its design and coordination and drafted the manuscript. All authers read and approved the final manuscript.